The design of this neat and attractive two-seat tractor biplane appears to have been something of a joint effort, with Geoffrey de Havilland, Henry Folland and Edward Busk each having some involvement. It might have been begun under the designation B.S.2, although this was soon changed to Reconnaissance Experimental No 2, clearly indicating its intended purpose. 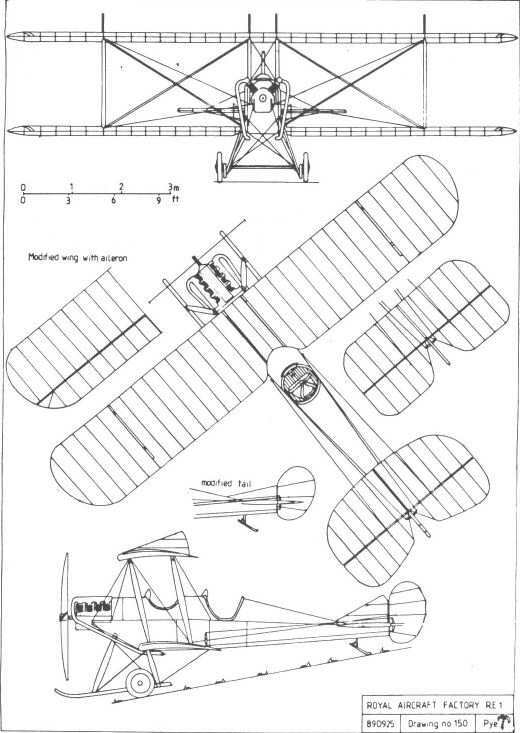 Although its derivation from the B.E.2 was obvious, it was a smaller and more refined machine, its role requiring it to carry no more load than its crew and sufficient fuel for its mission. The staggered single-bay wings had warping for lateral control, and used a recently developed aerofoil section which allowed a greater depth of rear spar, eliminating a weakness discovered in tests upon the B.E.2. The fuselage structure made some use of steel tube, was fabric covered, and had deep coamings giving well-protected cockpits. A triangular fin was fitted, together with a rudder of similar shape to that of the B.E.2, and the undercarriage employed only four struts, two fewer than in the earlier aeroplane. Neat aluminium cowlings enclosed the 70hp Renault engine, which drove a four-bladed propeller. To facilitate transport by road, the wings could easily be removed and strapped to the fuselage sides. A large wheel on the control column operated the wing-warping mechanism, one of the machine's less successful innovations being the incorporation of the engine controls within the centre of this wheel. 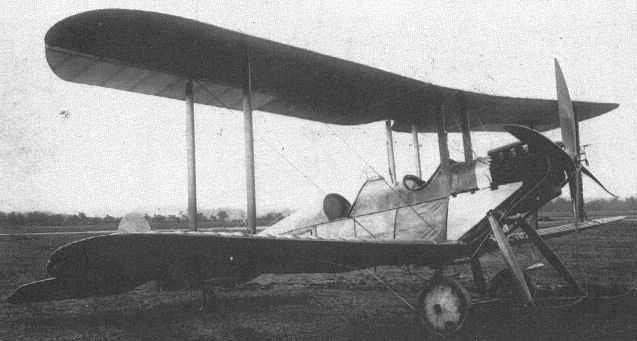 Two R.E.1s were built, the first, which became 607, being completed during May 1913. Following its initial flight tests it was used by Busk for a lengthy programme of development and test flying in connection with his investigations into inherent stability. Over a period of some months the dihedral angle was progressively increased from one degree to something in excess of three degrees. The fin area was reduced, that of the rudder increased, and a new tailplane of rectangular planform substituted for the original. These modifications gave longitudinal stability, but lateral stability proved impossible to achieve with warping wings, as their tendency to self-warp in gusts was too great. New wings incorporating ailerons were therefore fitted, and were rigged with their stagger reduced by four inches. On 25 November 1913 Busk was able to fly the machine for seven miles without touching the aileron control, relying on the dihedral to right the aeroplane in a gust. Turns were made on rudder alone, the machine automatically taking up the appropriate angle of bank. The second R.E.1 was completed by September 1913, and was allotted the serial 608. It differed from its predecessor in several ways; the fuselage was longer, the rudder included a curved balance area forward of the rudder post, and there was no fin. Later, four small rounded fins were fitted on the upper wing, one above each pair of interplane and centre-section struts. These were removed when new wings of increased span and incorporating ailerons were fitted early in 1914. In this form 608 was handed over to the RFC, which gave it the serial 362 on 6 March 1914, only to revert to 608 ten days later without the new number appearing on the machine. The aircraft was used by 6 Squadron up to the outbreak of the war, when it was reallocated to 2 Squadron to help bring the unit up to strength before it flew to France with the Expeditionary Force. On 1 September 608 suffered engine failure and was wrecked in the resulting forced landing. The first R.E.1 remained at Farnborough throughout its life, its stability making it ideal for testing various devices whose operation occupied much of the pilot's attention, most of them being connected with aerial photography or wireless transmission. It is not clear how many of the numerous modifications made to 607 throughout its life were designed to assist in achieving stability, and how many may have been intended to assess their effect upon what was already an inherently stable aeroplane. In the original design provision had been made for the installation of 1mm-thick armour plate on the forward fuselage, to afford the engine, fuel tank, and crew at least some protection against small-arms fire from the ground. This armour, which was to be made detachable, appears to have been fabricated during June/July 1913. Surviving records do not indicate to which machine it was actually fitted, how effective it might have been, or if and when the aeroplane was flown with it in place. However, its additional weight does suggest a logical explanation for the later increase in wingspan. The eventual fate of 607 is unknown, the last confirmed report of its existence being in February 1915, when it was still flying at Farnborough. 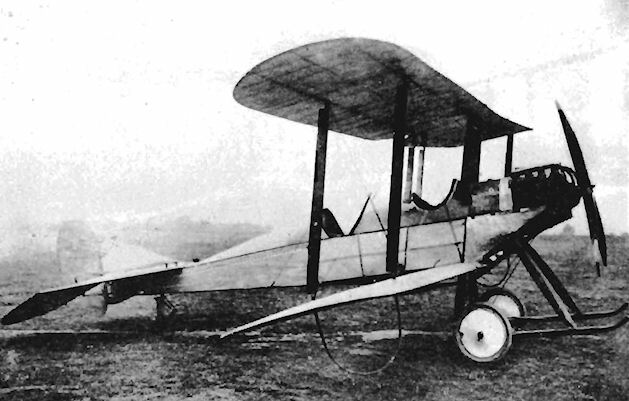 The first of two prototypes, serial No.607 was flown in May 1913, the second No.608 following in September 1913. Both were used for test flying at Farnborough, mostly by E.T Busk, in connection with improvements to aircraft stability, although the second machine was transferred to the RFC in March 1914. The RE. 1 was a single bay biplane, which in its original form, had staggered wings with warping control. The fuselage incorporated some steel tube in addition to wood in its structure and was mounted on a two wheeled undercarriage by four struts, a neater arrangement than that of the BE.2, from which the aircraft was derived. The tail unit was conventional, with tailplane, fin, rudder and divided elevators. 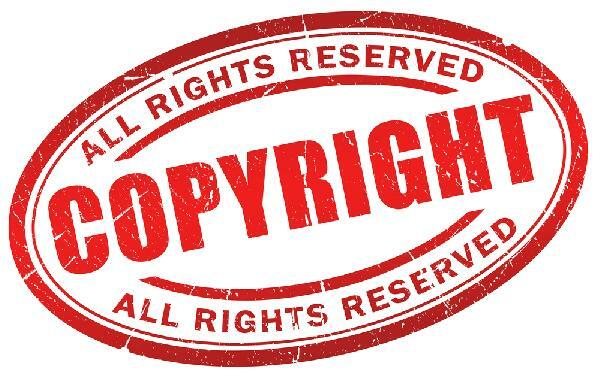 However, changes were made to a number of features during development. For a time on No.608, four small triangular fins were fitted above the top wings. Wings of greater span with ailerons were fitted, the stagger reduced and the dihedral varied. The fin was reduced and a larger aerodynamically balanced rudder fitted, together with a new tailplane with straight leading edge, square tips and new elevators to match. Provision for armor plate was made in the basic design and may have been fitted. A two-seat tractor biplane built in 1913 by the Royal Aircraft Factory as an improvement of the B.E. design for reconnaissance use, the R.E.1 provided an early example of the use of models and mathematical calculations to ensure stability, an inherent quality of the design to which a great deal was contributed by E. T. Busk's test flying. Both of the R.E.1s built had warping wings, but No. 608 had a longer fuselage than No. 607. No. 607 was subsequently revised with wings of reduced stagger, with ailerons instead of warping and with a smaller fin. No. 608 had its fin removed and was fitted with a larger balanced rudder. It was flown for a time with four small vertical fins installed above the upper wings. Both fuselages were of welded steel tubing, unusual at a time when wooden structures were favoured. The R.E.1 design was very stable, recovering automatically from dives and banks. No. 2 Squadron, R.F.C., used one R.E.1 on the Western Front during the 1914-18 War. A 70 h.p. Renault engine was fitted, and wing-warping was employed in the design. Maximum speed, 78 m.p.h. Climb, 600 ft./min. RAF RE.l. Only two of these machines were built in 1913. R.E. I No. 607 in its original form. The Army aeroplane, R.E. 1 which was flown before the King and Queen, on Tuesday last, by Mr. E. T. Busk, with Major Clive Wigram as passenger. It was this machine that was referred to by Col. Seely at the Wright Memorial Banquet, and by Dr. Glazebrook in his lecture on Wednesday before the Aeronautical Society, on the "Development of the Aeroplane." In general appearance the R.E. 1 resembles the B.Es., and its stability is not due to any radical departures in design, but must be explained, we think, by careful scientific proportioning of surfaces and distribution of weights. From the accompanying photograph it will be seen that ailerons are fitted to both planes, presumably more in order to inspire confidence on the part of the pilot than because they are actually needed.